Dr. Chunzhang Yang is a Research Fellow in the Surgical Neurology Branch at the National Institute of Neurological Disorders and Stroke. In 2006, Dr. Yang earned a Bachelor of Science at Peking University, China. In 2009, he earned his Ph.D. from the Neuroscience Research Institute at Peking University, China. Dr. Yang has been elected as the president of the NIH Asian and Pacific Islander American Organization (APAO) for 2014. 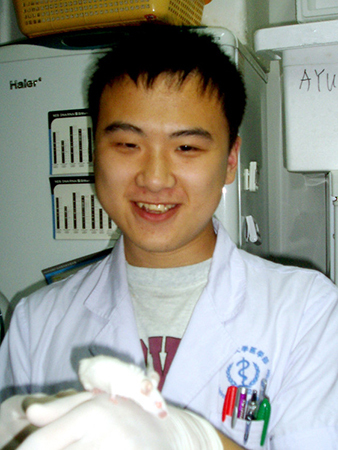 In 2010, Dr. Yang joined NIH as a post-doctoral visiting fellow. He is a productive researcher and has published twenty-five peer-reviewed articles since joining the NIH including contributions to the New England Journal of Medicine, the Journal of Clinical Oncology, the Proceedings of the National Academy of Sciences, and Blood. In addition to his academic duties, Dr. Yang is active in the Chinese community. He is the vice president of the NIH Chinese Scholar Association (NIH-CSSA) and is in charge of organizing different events, such as monthly happy hours for Chinese attendees around the DC-area (100-200 attendees each time), seminars about immigration, etc. He is also a member of the visiting fellow committee (VFC) at the NIH, helping to coordinate events facing new arrivals to the campus.